Have your upcoming nuptials announcement written among the stars with our Romantic Wedding Invitations. Our invites showcase a picturesque scene complete with a lovely couple standing under a star night sky, along with your wedding details. 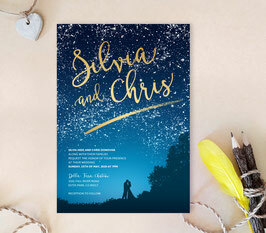 Printed on premium cardstock, our starry wedding invites are perfect for a romantic style wedding.